Running, Weight Loss, and Taco Tuesday! I did not want to get up this morning. I did not want to run this morning. But I did. And I’m better off for it. It added extra calories to My Fitness Pal for my overall consumption, to which I could then indulge tonight with… yes, you guessed it… tacos!! However, back to the morning run… again I was filled with all sorts of negativity about my running and progress. How am I ever going to reach my goal pace by September? I’m at a standstill and can’t seem to go any faster. What am I going to do to get faster? I never mentioned these nagging thoughts to my husband though. When he came home from work tonight and we recapped our day’s events, he must have sensed I needed a little pick-me-up. He said something that related to everything I was thinking this morning… “Don’t worry about your pace. You keep running like this, and it will eventually go down. Even if it’s not until next year, it will go down.” Ahhhh, good point. Eventually it will go down. While I wish I could run as fast as he can, I can’t, and to be honest, I don’t think I will ever be able to run that fast, but I do have hope that I will one day cross the finish line in the middle of the crowd, not in the back. Thanks for the encouragement, hunny bunny… I needed that. On another up note for today, I can officially say that I have beat that Stoopid Scale. 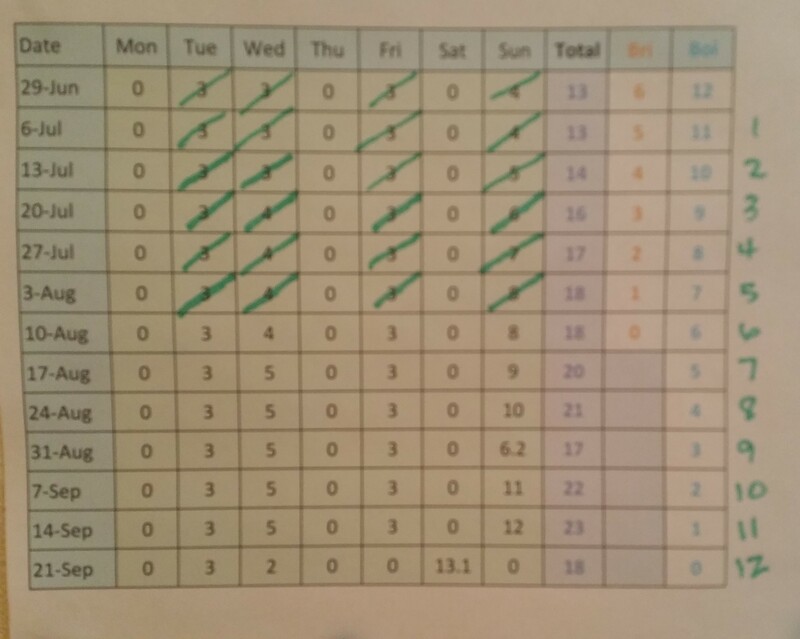 Since I began with the My Fitness Pal app back in May, as of this week, I have solidly lost 10 pounds. That’s 10 pounds in about 2-1/2 months. Slow going, but it’s a solid loss and it ain’t coming back. You can see how much I don’t sit on my posterior, and I take in a healthy 1300 to 1600 calories per day. I eat rubbish like quinoa, wheatberries, flax seed, sweet potatoes, and whole wheat pasta for my carb loads, and I eat a ton of protein. While I won’t give into the low-carb fad, I do occasionally skip carbs in the evening and just have veggies and protein. I usually always have some type of dessert, be it a pudding pack with whip cream, a Skinny Cow Ice Cream, or a slice of pound cake with whip cream (nothing more than 100 calories), and I always have a happy hour celebration on Friday night. I don’t and won’t miss out on anything. Been there, done that, ain’t doing it again. Anyway… time to move forward and focus on the next 10 pounds!! Training plan for Boise… OMG. Half-way through it. I have just begun my 6th week of training for Boise. Will I progress enough to hit my original goal? Or will I have to wait until the Maui Half in January to reap the benefits of my hard work? Time will tell… but for now… it’s Taco Time!! 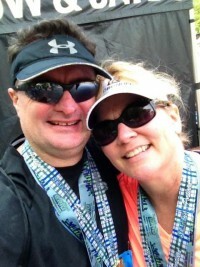 This entry was posted in Training and tagged beginning running, blogging101July2015, dieting, Fit One Boise, Half Marathon, My Fitness Pal, running, training, weight loss on August 11, 2015 by Paula. This was so encouraging!! I truly needed to read this tonight. 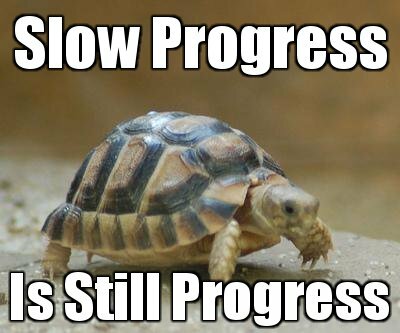 Slow and steady. Love your balance! I totally understand that morning battle with your brain… Glad you went running and tacos sound fabulous – you earned them! I woke up this morning not in the mood to run and read this opening line “I did not want to get up this morning.” So I thought “damn, I’m not the only one” so I ran this morning! If it helps If noticed that my pace times for the first 2 miles are slower now than ever before, but I do find my mid pace times are a little quicker. My performance is never consistent, but I do find the slower I run the more distance I can cover. Thanks for the motivation this morning! Aaaaaah the halfway point!! Exciting 🙂 I’m glad you got out and ran, I always feel worse about not running than anything. Good job on your loss and healthy eating, you have great carb choices! I like that you treat yourself for your hard work! You’ll definitely make your goal! Congratulations on the ten pounds. That is just awesome!! And BTW, I’ve found that the earlier I run, the slower my first mile is.